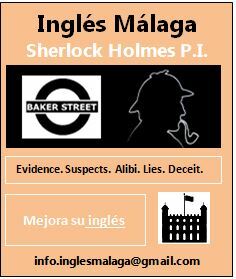 INGLÉS MÁLAGA – PLAY GAMES: SHERLOCK HOLMES P.I. It´s after midnight and the streets of London are covered in thick fog. On Baker Street, someone or something evil is lurking in the dark. Unfortunately, Sherlock Holmes is paralysed with fear, and his faithful partner, Dr Watson, has retired and gone to live on the party island of Ibiza. Dark deeds and criminal activity are on the increase, and the City of London is calling out for help. Can you answer their call? Do you have what it takes to become an Inglés Málaga Sherlock Holmes Private Investigator? Do you want to practise and improve your English oral communication skills in a fun way? Can you find the evidence? Can you track down the suspects? Can you uncover the truth from the lies and deceit? Can you make an arrest before the villains make their escape? Are you ready? If you think you’ve got what it takes to be an Inglés Málaga Sherlock Holmes Private Investigator, and you want to improve your English communication skills in an entertaining way, why not take part in the Inglés Málaga´s Sherlock Holmes P.I. event? Required English Level: Every game will be adapted to suit different levels. Minimum B1. Number of participants: Between 3 and 6.